Should missionaries use support money to take vacations, and should they share the news of their vacations on social media and blogs? We had to grapple with these questions this last month. We are always concerned about announcing vacations because often times reports on trips, specifically vacations that do not involve ministry reporting or support raising, elicit some rather insensitive comments from people. The difficulty of answering the question of whether we should use support money to pay for a vacation or not was compounded for us this year in that our monthly support levels remain lower than what our monthly expenses are and the donations for June and July had dropped further (as it generally does every summer). We felt guilty using money we did not have to do something that initially seemed frivolous. As we continued to pray about whether to pay for a get away or not, we were approached by one of our supporting churches and were told that they wanted to help finance part of a getaway for us. We were encouraged by yet another person that said taking time and getting off site (especially since we live where we work) would provide much needed rest and recuperation after a very busy, hot/humid, physically and mentally draining season. Rest is biblical; God worked at Creating everything in six days; then He rested, not because He was tired but to set the standard for mankind to follow (Genesis 2:2-3). Rest is important; it prevents burnout. Rest in the form of vacation time is pretty standard for employees anywhere. Like many missionaries who live at their place of ministry, we don’t punch a clock and often work 7 days a week for weeks upon end. As for sharing photos and news of our vacation on social media or in blogs, we were challenged to not shy away from sharing the blessings God gives us. Time away and how God provides for it can be a testimony to God’s care and provision. So, we said “yes” to a vacation and are now saying “yes” to sharing the good news of God’s provision! 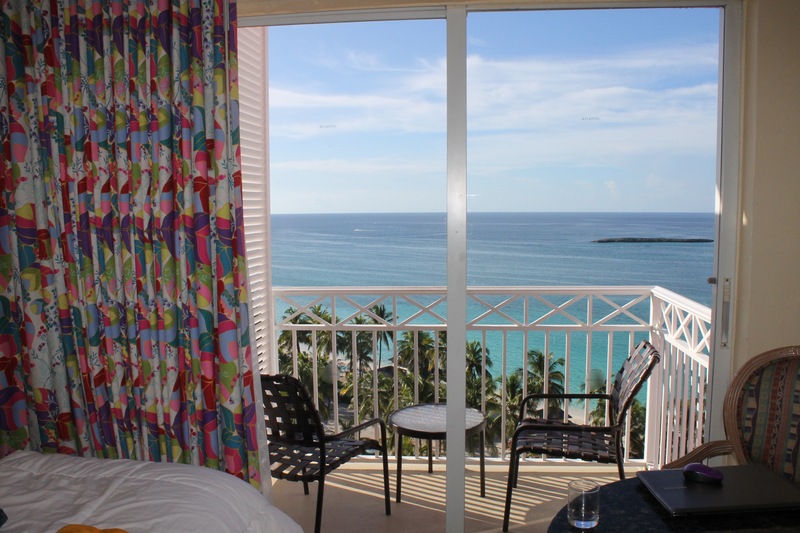 Upon first entering the room, we were greeted with this AMAZING view! On August 17-21 thanks to our encouragers, a great “deal” from a contact at Atlantis, and a generous donation from one of our supporting churches, we disconnected from ministry work, rested, played in the water together, enjoyed the beauty of the ocean from our 9th floor guest room, rubbed shoulders with tourists, and absorbed a lot of around the clock a/c at the world renowned Atlantis Resort! Our room was the top floor just to the right of the center palm tree. Our room was the room on the top floor above Tim’s head. Rainstorm came in quickly one evening. Beautiful sunset from our balcony! Zach and Logan spent time playing computer games. Touring the Dig and lobby of the Royal Towers. The not-so-lazy river at Atlantis. View from balcony while sitting doing my devotions. Time to relax, sleep and read a novel. Although Atlantis is only 7.7 miles from our home/ministry, what we experienced while on that side of the island was such a polar opposite to what we experience everyday on this side of the island that in some ways we felt we were worlds away. We remember one night looking out over the city lights of New Providence from the top of the Paradise Island exit bridge (we walked to the top one evening) and thinking how different the two worlds are here: Paradise Island with all the tourists, money, and frivolity and New Providence Island (specifically in the area where the ALC&C is situated) with people living normal and even subnormal lives. How can there be such a dichotomy in such a small area. We returned to Camp blissfully tired but relaxed and rested (we know this sounds like a contradiction, but it isn’t). God is so good to us! No hurricanes yet (Erika threatened to visit us, but fell apart before she could get here), but oh the heat and humidity! Bahamas weather data online confirmed what we already knew from experience: this summer was hotter than normal! There were four days since June 15th where daytime highs were less than 90 degrees (86-89 degrees). The night time lows were around the 80 degree mark. Add in the high humidity, and we had heat indexes well above 105 degrees nearly every day. In the States, these temps are not hard to deal with because air conditioning is prevalent and relatively “cheap”, but here we do not run our air conditioners but at night due to high energy costs. Working in these hot, humid conditions is not only uncomfortable, it is also exhausting. Some ALC&C staff took breaks from the heat by leaving the island for vacations and enjoyed the cooler temps of the upper midwest; the rest of us learned to change our shirts often, drink LOTS of water, and find shade whenever possible. We are looking forward to cooler temps in month or so. We picked up a group of 23 very excited young people to come to Camp for a weekend in early August. They had a great time and are looking forward to a week long Camp next year. The leader of the group, Samantha, used to attend Joy Bible Camp as a child. It was great ministering to these young people. On August 8th, Winky (one of our Summer Day Camp Counselors) held a community outreach. ALC staff provided a Gospel puppet show, live animals, face painting, and Mark gave his testimony. Staff and Camp often get visitors from afar: parents and siblings, adult children, past facilitators, former missionary volunteer staff, and even people who have “found” us on the internet. We love the encouragement, not only in the little care packages that some of them bring us, but also in their mere presence and the extra set of hands they offer to do some of the work that needs done around here. Marga had a relationship with ALC&C years ago when she came with Judson University on a mission trip. She is back on the island to teach architecture at College of Bahamas. We were able to provide temporary housing while she found a place to live. She has been a blessing and encouragement to all of us. Julian was Progam Director at the Centre 12 years ago. Since returning to Toronto, Canada, he comes back for a visit in the summer. This year he came for three weeks. We enjoyed spending time with him and appreciated the painting projects he completed. Loved having both my boys back! Logan helped with worship at our church. It was good see him back on stage! The college kids back at Kingdom Life Church. Kevin came to see Logan. Pastor Cranston was another person Logan wanted to see. Bradley King was one of the people Logan wanted to see (Bradley brought his sister Vanria). Then is was time to say good-bye on the 25th. It was like old times again having Logan here. We enjoyed time around the Camp together, and he was able to join us on our getaway to Atlantis. The 2 1/2 weeks he was here flew by, but we had a great time reconnecting with him. 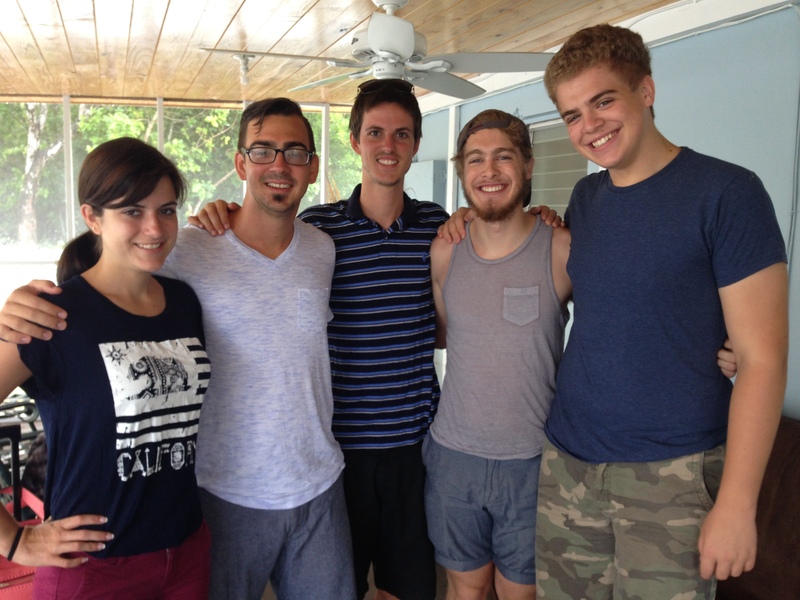 Geoff De Sousa (light gray t-shirt) was a facilitator for about three months when we first arrived in 2013. He and his girlfriend and her brother were on the island for a family wedding. It was great getting to connect with him again. We had our first leader’s planning meeting last Friday and are looking forward to starting weekly Youth Outreach meetings on Friday, September 18th! Last week we had some anxious young people calling to see if it was starting that night. We had to disappoint them and tell them it would be two more weeks. We will be focusing on the Fruits of the Spirit. On October 9-11, we will be hosting our second Young Adult Weekend at Camp. Jay Seegert from Creation Education Center in Wisconsin is the guest speaker. Jay is bringing his wife Amy with him again. It is going to be an exciting weekend, and we are looking forward to it! Testimonies from veteran staff during daily devotion time. Facilitator bonding at staff houses. We enjoyed dinner with the facilitators at our house. What better way to start the new year, celebrating July and August birthdays! A new school year has begun, and that means coming back together as a staff at the Centre every morning for devotions (a highlight of the day for many of us). The last 2 weeks we have been doing staff training. It has been a great time of bonding. The first school groups will arrive in 2 weeks, and after school Adventure Clubs will be starting that same week. 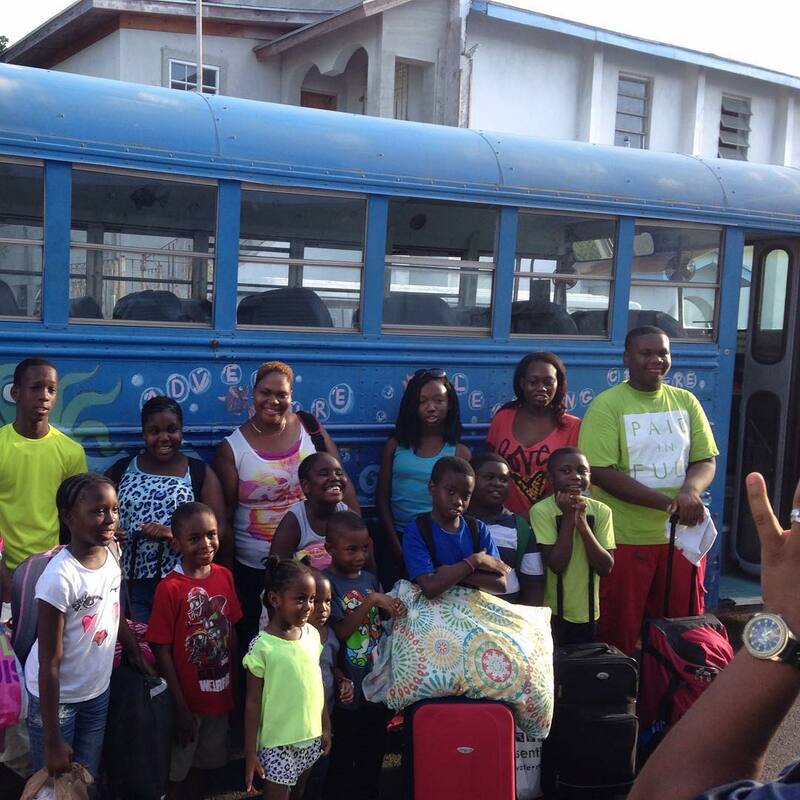 We have also heard that we have received grants from various Bahamian organizations and from the Bahamian government. The $25,000 grant from the government will allow us to bring in children from poor schools at no cost. Exciting times! Micah Godsey and her mother Joan. 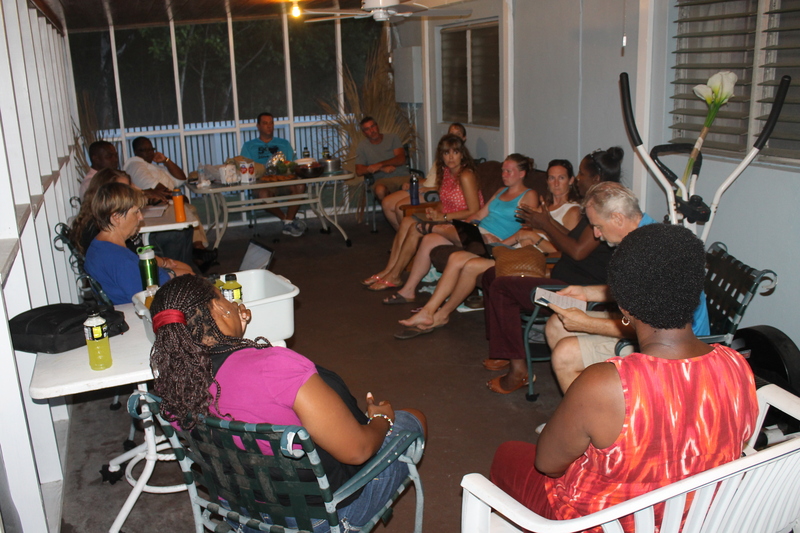 We have three new facilitators at the Centre: two foreign missionary volunteers and one paid Bahamian. 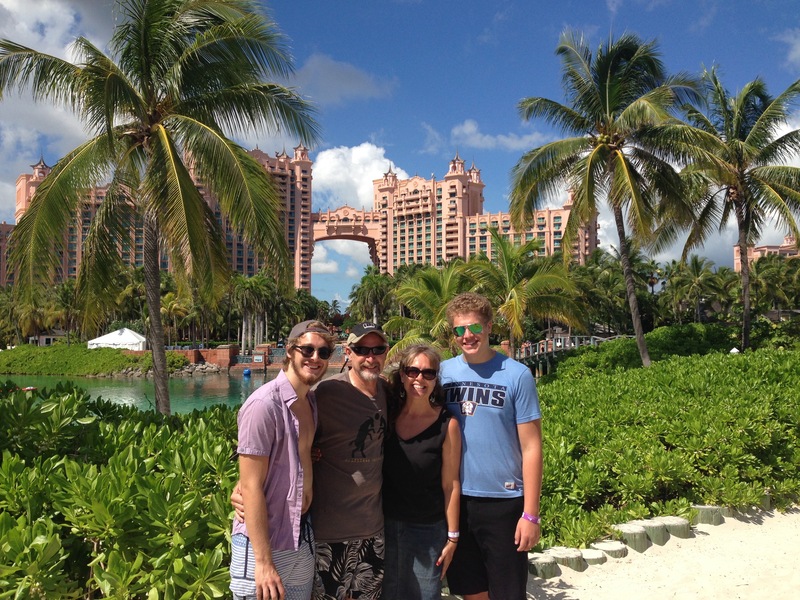 Micah is from Bedford, IN, Charlie is from London, Ontario, Canada, and Hope is from here in the Bahamas. Welcome aboard ladies! Out with the old to make way for the new! Cabin 3 is slowly coming down. Packing-up and cataloging all Bob and Faye Browning’s belongings preceded the demolition project. The utilities have been disconnected and all the fixtures have been removed. We are trying to reuse and recyle things. We hope to use the roof to make a covering for a leaking storage container. As soon as the cabin is taken down, we hope to get teams or individual volunteers here to help construct a new cabin. The new cabin has to be completed by January 6th. If you or someone you know would like to come down this fall to help with construction, please let us know. Spending time together in prayer and celebrating Janice and Jen’s August birthdays and Marga’s God-given apartment. There is a long story behind this, but I don’t have time and space to share right now. God is good! The last first day of school for the Seeley Family Academy was August 24th! This is our 15th and final year of homeschooling. It is hard to believe we have reached this year already. Sheldon and his wife are currently YWAM missionaries in the Caribbean. Sheldon preached at Kingdom Life Church this past Sunday. He spoke on “Gaining a Passion For Missions”. Lord willing he will be heading to Louisville, Kentucky to attend Sovereign Grace Ministries Pastor’s College. He would like to start a Sovereign Grace Ministries church in Jamaica. We met Sheldon last October at the Pastor’s conference in Nashville, TN. This is never easy to say, but we feel we need to be honest and let you know what is going on. Donations to our ministry have been down the last couple of months (and education bills are coming due). Summer months are traditionally very lean months, so we are not overly concerned. However, we are not fully funded even in our best months, and when the donations drop lower, it becomes a further strain on our budget. If God lays it on your heart to donate and/or partner with us in our ministry work, you may click on this link (Shepherd’s Staff) which will take you directly to our funding organization. Please pray with us that God provides the needed funds to cover our expenses. The prayer requests under the “Prayer” tab above have been updated! Thank you for your interest in our lives and our ministry work. May God bless you!